In his paper, “The Dispute Over Control Theory“, Bill Powers tries to clarify how Perceptual Control Theory (PCT) differs from the two main causal approaches to psychology: stimulus-response and command-response. In order to gain a deeper understanding of PCT, I’m gonna try to reproduce Bill’s argument in this post with my own words and pictures. 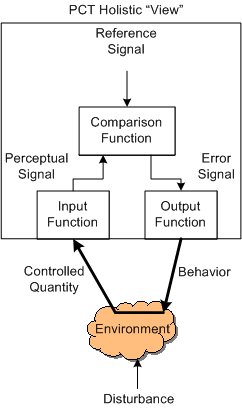 The figure below represents a PCT unit of behavioral organization, the Feedback Control System (FCS). An FCS is a closed loop with not one independent input (e.g. stimulus or command), but two. 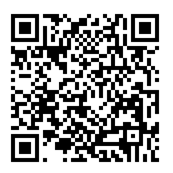 One input, the reference signal, is sourced from the output function of a higher level control unit(s). The second input, an amalgam of environmental disturbances, “invades” the loop from outside the organism. Both inputs act on the closed loop as a whole and the purpose of the FCS is to continuously act on the environment (via muscular exertion) to maintain the perceptual signal as close to the reference signal as possible. As the reference changes, the behavior changes. As the disturbance changes, the behavior changes. Since action is behavior, the FCS exhibits behavior to control perception; behavior is the control of perception. 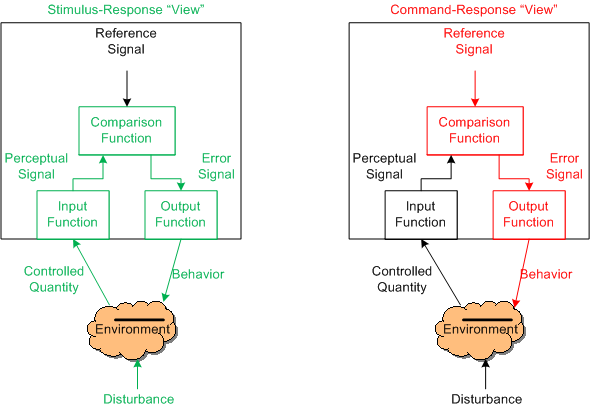 The figure below depicts models of the stimulus-response and command-response views in terms of the PCT FCS. The foremost feature to notice is that there is no loop in either model – it’s broken. The second major difference is that neither model has two inputs. So, you may ask: “How could our best and brightest minds in psychology and sociology gotten it so wrong for so long; and why don’t they embrace PCT to learn how living systems really tic?” It’s because they erroneously applied Newton’s linear cause-effect approach for the physics of inanimate objects to living beings and they’ve thoroughly crystallized their UCBs into cement bunkers. When you push a rock, there is no internal resistance from the rock and Newton’s laws kick into action. When you push a human being, you’ll encounter internal resistance and Newton’s laws don’t apply – control theory applies. D’oh! BD00 takes major offense at Bill’s last sentence.